Welcome to the best chinchilla and pet forum ever! Lucky's Place is FREE to join...Guests don't get to see most of the good stuff. Members, Staff and owners of all other forums are WELCOME HERE! Thanks for coming by and joining us. This is a special and fun place. Here you will find our welcome messages. Lucky's Place is a proboards forum and we need to follow certain rules. Please read their terms of service. Lucky's Place is owned by Jamie Glaser and Ilka Dalai. No one under 18 may post pictures of themsleves, and may only PM staff. (personal message). Members, staff and owners of other forums are WELCOME HERE. We ask that you please dont copy-paste things from Lucky's Place to other forums without permission from the staff on this forum. As long as you care about the care and welfare of animals..YOU ARE WELCOME! The MAXIMUM size for posted pictures is 640 x 480. Please resize your pictures before posting. There are instructions in the HOW TO section. but in general be cool please. If you have a PET related business you will need 25 quality posts to be listed in our vendor or store section. There is no advertisng permitted concerning, price, sales, specials etc. Lucky's Place is NOT a free classified website. Soliciting our members for donations is prohibited. This is a rescue friendly board. EVERYONE is welcome but we ask that there are no posts about PELTING, techniques of pelting by anyone in the fur industry. We believe fur belongs to the beautiful animals born with it. We discourage breeding of chinchillas by non professionals who do NOT know the genetics of their chinchillas ..however if you find yourself in need of help ..should breeding occur , we will do our best to help you. This board is where you introduce your chinchilla. 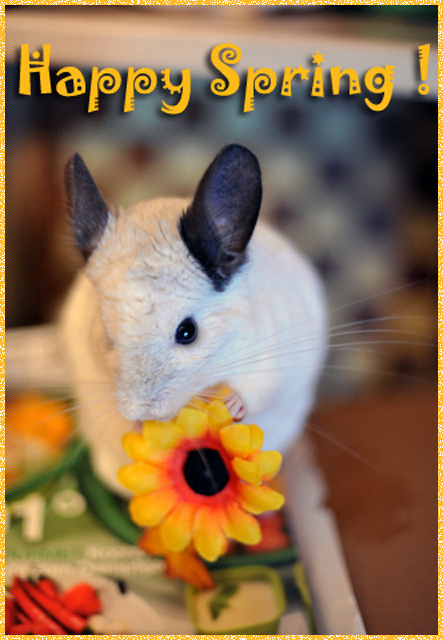 We look forward to seeing pics, videos, and stories about your chinchillas antics. This is a restricted board. Only members can see. This board is for members who have had kits unintentionally. Pictures can be posted with permission only. On this board you will find our care sheet, health advice and information in case of emergency. 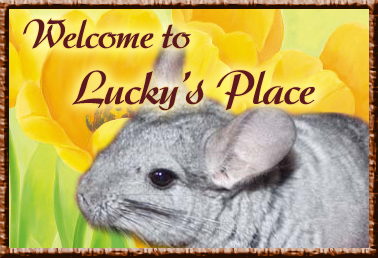 Lucky's Place, its owner and members are not liable for illness or death resulting from advice posted here. PLEASE CALL AND VISIT YOUR VET IMMEDIATELY. Our expert members share how you can make great chinchilla accessories. You can find info on DIY(Do It Yourself) projects like building cages, wheels, shelves, toys etc. Please share some things you would like us to know about you. Introduce yourself. Here you can learn how to easily share your pictures and videos. Here you can talk about other subjects besides your pets. All kinds of things go on in our world ...share your thoughts. This board welcomes all pet lovers and all kinds of pets, large and small, furry and non furry. Please post pics , videos and stories about your other pets besides chinchillas here! On this board we can all share our emotions when one of our dear pet friends pass away. You need 25 posts to sell on this board. Please DO NOT list prices, just tell about your items for sale and ask that members PM you or email you. On this board you will find the members only store and rescue resource page. Please support the members of Lucky's Place. No Illegal items can be sold here on this board. Here we can wish our members and/or their pets a happy birthday and join in the celebration.